As city and suburb dwellers, we generally think that agriculture, rural land use, and public infrastructure are the main focus areas for environment action. However, we gardeners and homeowners have an important role to play as well. All of us can help keep our drinking water clean and environment safe by reducing the pollution and chemicals that enter the river from our yards. 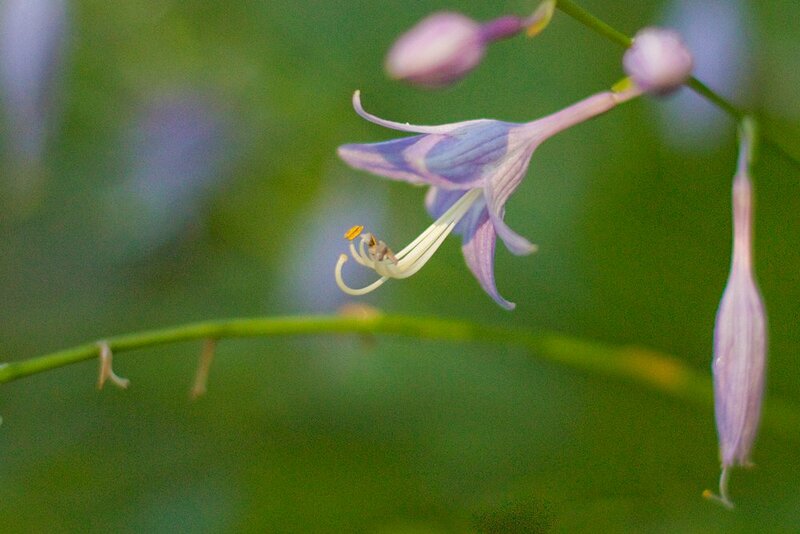 At Backyard Bounty, we are committed to protecting our environment by helping customers and communities design, build, and maintain sustainable, native, clean-water landscapes. 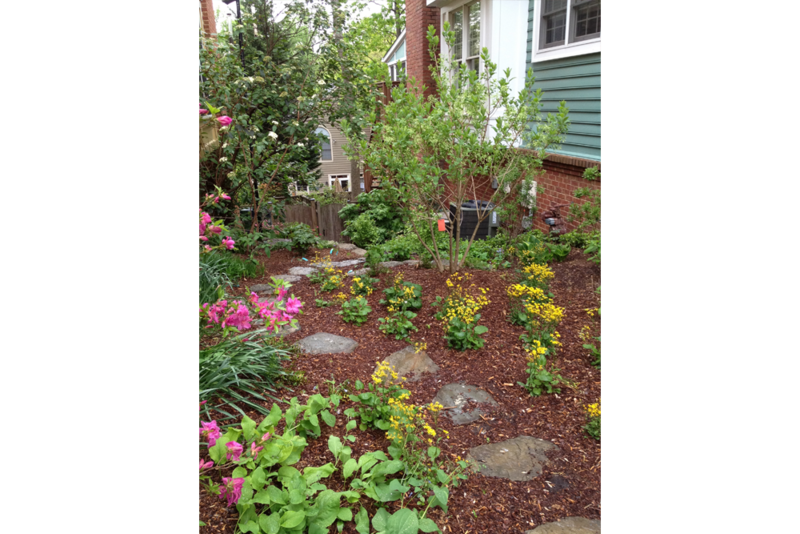 A new, beautiful space on a challenging site where plantings struggled to survive. 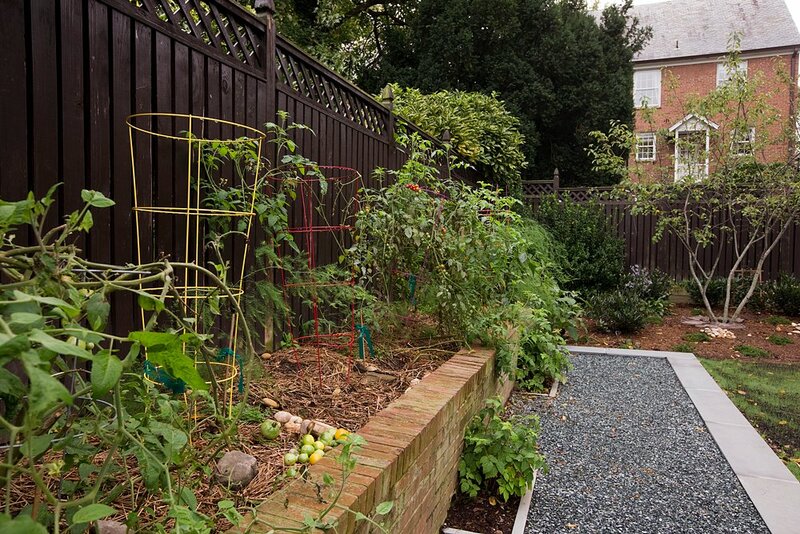 This garden was developed in a shaded, narrow, deeply sloped strip between two houses where water eroded the soil and carried runoff down toward Rock Creek Park. 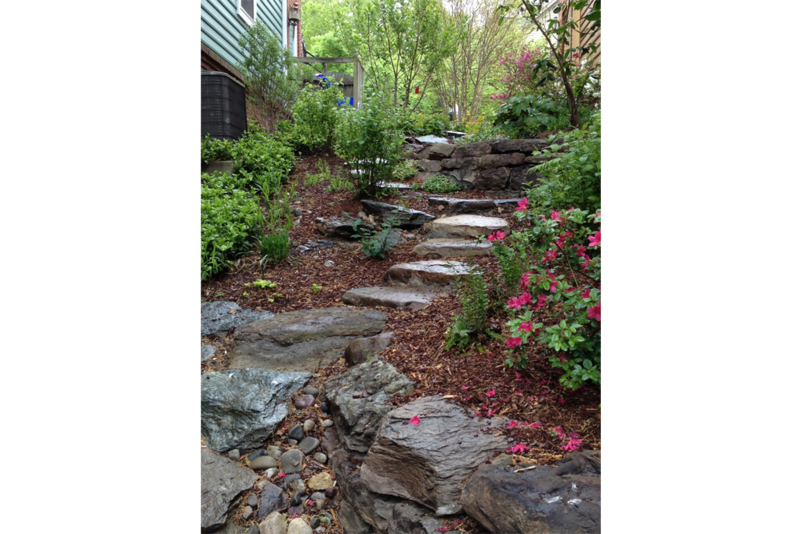 Backyard Bounty installed a switchback path to make the slope more manageable and constructed a series of natural boulder retaining walls to create pockets for plantings that slow down and capture rain water. Planting the garden with a variety of natives created a healthy habitat for birds and butterflies. 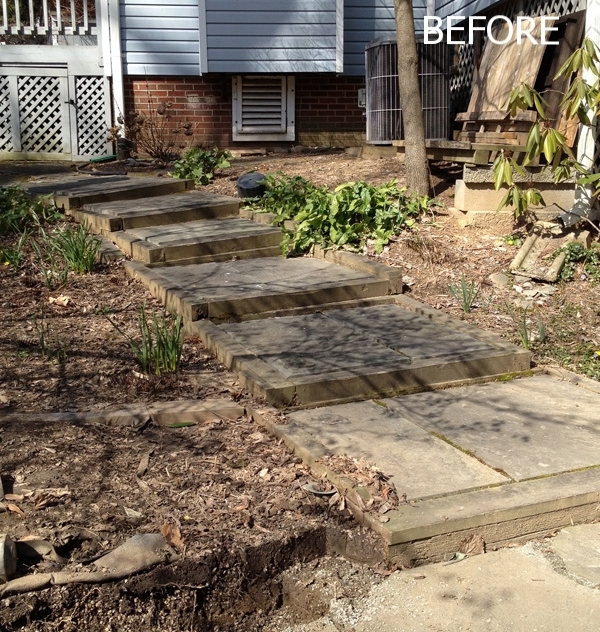 Once a pass through for polluted water on its way to Rock Creek Park, this garden now re-charges the groundwater with that runoff, invites passersby to walk through and enjoy the space, and provides a vista of flowers, birds and butterflies for the client from her kitchen window. A recent transplant from the San Francisco Bay Area, the client wanted to grow her own tomatoes and have a nice lawn for her family to play on. The soil test indicated an unusually acid soil — perfect conditions for blueberries, not so great for veggies. 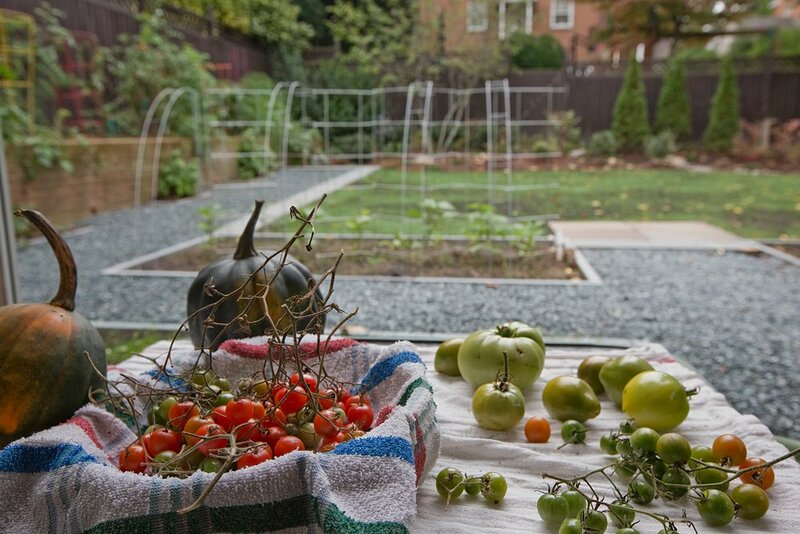 Backyard Bounty designed a stone-edged, geometric garden of raised planting beds and brought in topsoil and compost to make soil conditions suitable for vegetables. After installation, rains from a heavy storm carved a path through the yard. Recognizing the serious runoff problem, we turned the water’s path into a dry stream, removed a decaying pond and installed a rain garden to manage this runoff. We reused stones that had surrounded the old pond as material for a path through the garden. The new ‘Eco Lawn’ grows so slowly it only needs mowing once a month. Its roots penetrate deep into the soil, making it more drought tolerant than traditional lawns, and therefore, less resource intensive. 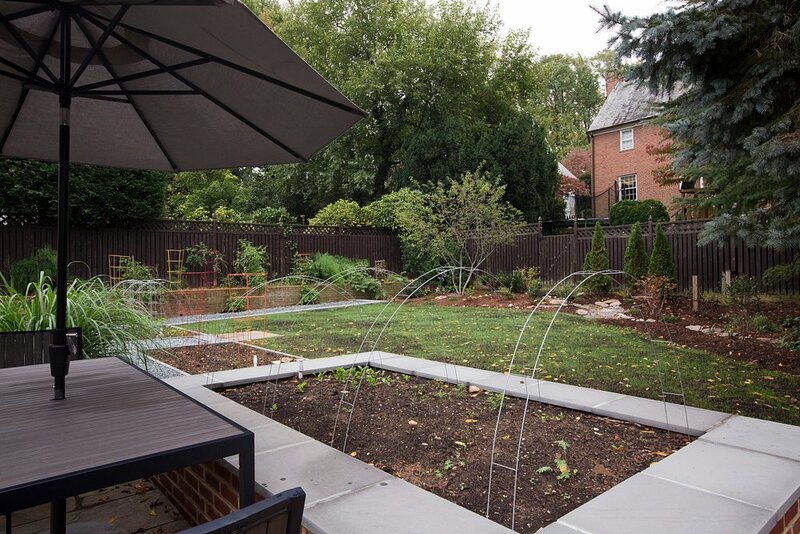 The owners love their new kitchen garden, the beauty of the new asparagus bed and the cucumber vine that climbed 15 feet up a tree. A cohesive design for the back garden that would both create a lovely space and solve significant drainage problems. Massive amounts of water from uphill properties put pressure on the gardens, eroding and compacting soil and making it hard for plants to grow. Deer lived in the back garden and, along with rabbits, damaged trees and ate plants. Loss of an old tree meant lost shade on the deck, and the existing island bed needed a design that would integrate it with the rest of the landscape. Backyard Bounty developed and executed a plan for the island garden that provided more shade on the deck and integrated the island with the rest of the landscape, rebuilt the existing walkway, replaced timber frame steps with boulder stairs, and built a curved retaining wall to define the path and minimize erosion and compaction. 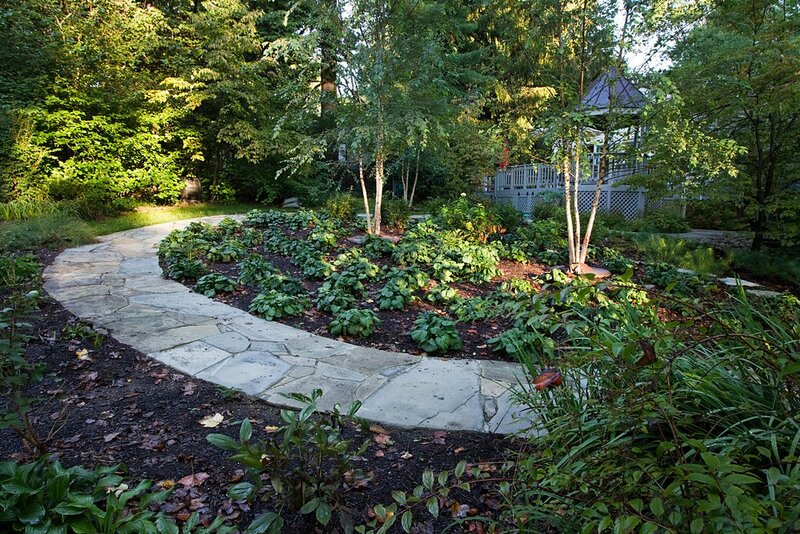 A curved retaining wall helped define a path, but is also crucial to minimizing erosion and compaction. 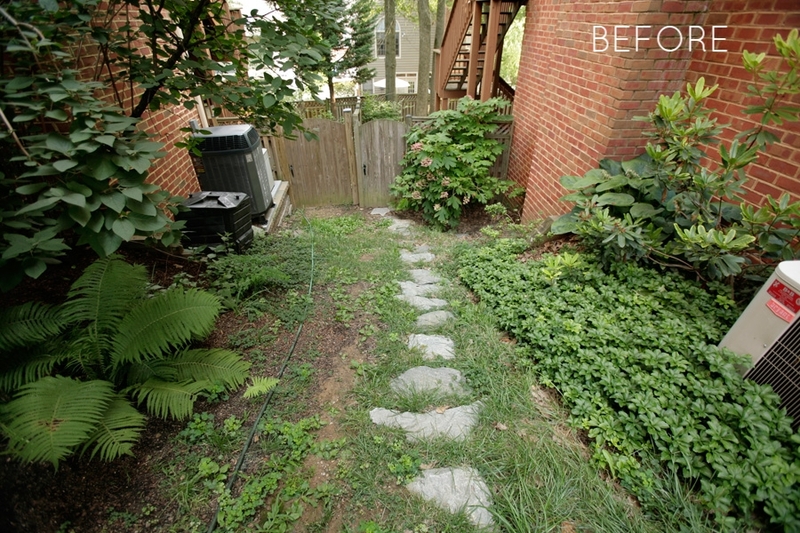 We removed large quantities of an invasive groundcover and improved growing conditions so that native plantings thrive and keep garden topsoil from washing away. Now more than ever, it's up to all of us to do what we can in our own gardens to take care of our environment. It’s the ultimate expression of “think globally, act locally.” Here is a resource guide for local gardeners looking to do their part for clean water. With all the progress made since the Clean Water Act was passed in 1972, it may still surprise you to learn there are plenty of ways you can still legally pollute the Potomac River. Learn how our community allows pollution into our Nation's River – the drinking water source for you and nearly 6 million people – and what you can do about it. An increasing number of businesses and local governments are turning to green roofs to curb pollution, which is welcome news for our rivers and streams. Find out what local county is leading the charge in renovating rooftops to make its communities more river friendly. Thanks to policy incentives and community demand, local developers are embracing river friendly growth and making strides in reducing the amount of polluted runoff that floods the Potomac. Find out what innovative program in DC is setting out to spur investment in nature-based solutions and might one day serve as a model for cities across the country. A cattle farmer and soil scientist walk onto a farm . . . There's no punch line. Hear the story of Bobby Whitescarver and Jeanne Hoffman whose love led to a marriage of farming and conservation along the Shenandoah Valley's Middle River.